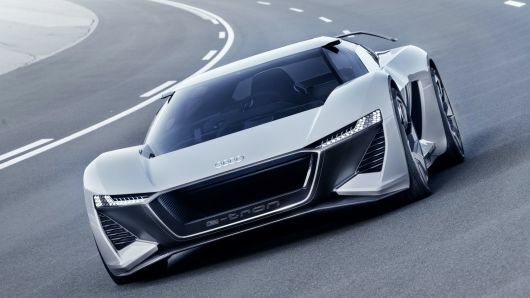 Audi PB 18 e-tron goes from 0 to 60 in 2 seconds - The Maghreb Times ! Audi just put Tesla on notice, unveiling an electric supercar prototype that can go from 0 to 60 in 2 seconds, USA Today reports. But don’t expect a zoom zoom: It’s electric, so it’s quiet. Unlike sports cars, electric vehicles don’t have engines and thus don’t make window-rattling noise as they whip down the street. The concept car’s reveal comes ahead of the official debut of the Audi e-tron electric production SUV in September — which is viewed as a serious competitor for Tesla in the luxury electric vehicle space. Unlike the Audi e-tron, the PB 18 e-tron won’t be coming to dealerships anytime soon. But it’s nice to dream once in a while. That blisteringly fast acceleration would place it among the world’s fastest cars. While that technology is not currently available widely, it’s on its way. This car’s interior is designed to empower track driving. Frankly, it’s made to go obscenely fast. Audi designed a cockpit paired with a “monocoque shell that can be slid laterally,” so that the driver can sit in the center of the vehicle for optimal vision and control. When the driver’s seat is pushed to the side, there’s room for a passenger. Since this is a prototype car, there’s no pricing to speak of. Which is probably for the best. That would just ruin the dream. Next articleIs globalization just another form of imperialism?